Colorado has begun March with a range of snowpack conditions across the mountain system, even as the southern mountains are experiencing a significant uptick in snowcover from a multi-day storm (CSAS Storm #10, in progress as of this writing). This Update evaluates March 1st and 2nd SWE data from Snotel stations associated with our eleven CODOS sites and places them within the framework of the Dust Enhanced Runoff Classification scheme (DERC) developed by CODOS. This Summary examines the state by Basin, and CODOS site-specific analyses are also presented for each CODOS site (linked below). Over the course of our 2005-2015 period of rigorous observations, March 1 has marked the beginning of the heart of “dust-on-snow season” for the Colorado mountains (see the CODOS Dust Log chart of dust events by month). As of this writing, and pending a post-storm inspection of the new snow being delivered by Storm #10-in-progress, no dust-on-snow events have been observed so far during WY 2015 at Senator Beck Basin, the primary ‘sentry site’ for the CODOS program. As of March 2nd, Colorado snowpack water equivalent (SWE) remains varied among the major basins, generally near or below 1981-2010 median levels, and no basin is reporting a notable abundance of SWE. (DERC “Average” SWE equals day median +/- 10%). Basin scale WY 2015 March 2 SWE conditions (NRCS data) classified using the Dust Enhanced Runoff Classification Scheme described in the January 21, 2015 Update. 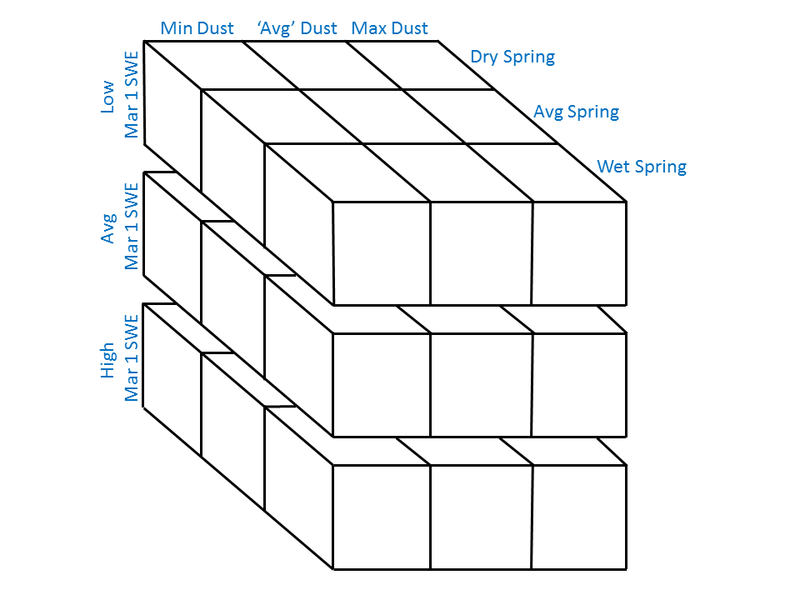 As described in our January 21 Update, this DERC framework will be utilized to identify prior years with similar patterns in dust-on-snow intensity, March 1 SWE, and spring precipitation conditions, and their associated hydrographs. As of March 2, 2015, the basins listed above have entered the “dust enhanced runoff space” shown below in either the Low or Avg March 1 SWE layer domains. The same March 1 SWE analyses have been performed for each CODOS site and hydrographs from 2006-2014 associated with the given March 1 SWE condition have been identified. An ‘exploded view’ of the Dust Enhanced Runoff Space, separated by March 1 SWE classifications. It now remains to monitor how WY 2015 dust conditions and spring precipitation evolve, and to further define the set of plausible hydrographs using prior season examples. The NRCS basin-scale SWE condition plots below use non-exceedence probabilities to project a range of future snowpack conditions, from the least likely (historical max and min traces) to the most probable (50% trace), based on the historic record. Statewide, NRCS indicates a nearly 90% non-exceedence probability of achieving a median snowpack. As they become available in early March, similar NRCS site-specific projection plots will be posted to each CODOS site’s web-page. The NOAA Climate Prediction Center also provides seasonal outlooks for March/April/May (MAM) precipitation and temperatures (below). The current M/A/M precipitation outlook suggests substantially improved chances for above-average spring snowfalls, a possibly ”Wet Spring” in the DERC framework. However, many of the same storms that would deliver this enhanced spring precipitation could traverse the Colorado Plateau and generate SW’ly wind fields capable of also delivering dust. As discussed in our February 26 No-Dust Alert, recent and ongoing weather over Colorado Plateau dust source areas will, perhaps, delay the availability of loose soils and dust until later in March – time (and weather conditions) will tell. The CODOS team will perform our first circuit of our ten CODOS sites (beyond Senator Beck Basin) sometime during mid-March, weather and dust conditions dependent. Snowcover temperatures, SWE, and dust presence/absence will be observed, along with basic snowpack structure, in full-depth snow profiles at each site, as usual.